석등은 부처의 광명을 상징한다 하여 광명등(光明燈) 이라고도 하며, 대개 대웅전이나 탑과 같은 중요한 건축물 앞에 자리한다. 일반적으로 불을 밝혀두는 화사석(火舍石)을 중심으로, 아래로는 3단을 이루는 받침돌을 두고, 위로는 지붕돌을 올린 후 꼭대기에 머리장식을 얹어 마무리한다. 이 석등은 큼직한 연꽃이 둘러진 아래받침돌 위로 가운데기둥 대신 쌍사자를 조각한 것이 특징이다. 두 마리의 사자는 뒷발로 버티고 서서 가슴을 맞대어 위를 받치고 있는 모습으로, 사실적이면서 자연스럽게 표현되어 있어 주목된다. 8각의 화사석에는 4개의 창이 뚫려 있고, 지붕돌은 여덟 귀퉁이에서의 치켜올림이 아름답게 표현되었다. 장식이 번잡하지 않아 간결하면서도 사실적인 수법이 돋보이는 통일신라시대의 작품으로, 그다지 크지 않으면서도 뛰어난 조각기법과 아름다운 조형미를 보여주는 걸작이라 하겠다. 원래는 중흥산성내에 있었으나, 일본인이 무단으로 반출하려 하여 경복궁으로 옮겨 놓았다가 지금은 국립광주박물관에 전시하고 있다. Korean Buddhism has a long tradition of setting up one or more stone lanterns symbolizing the all-pervading light of Buddha’s wisdom in front of the Hall of Shakyamuni or a pagoda in a temple. 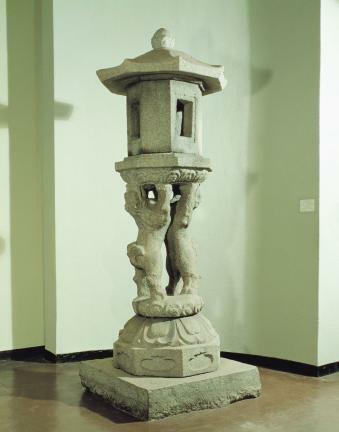 Traditionally, a Korean stone lantern consists of four sections, a three-tier pedestal, the main body containing the light chamber, a roofstone, and the finial. 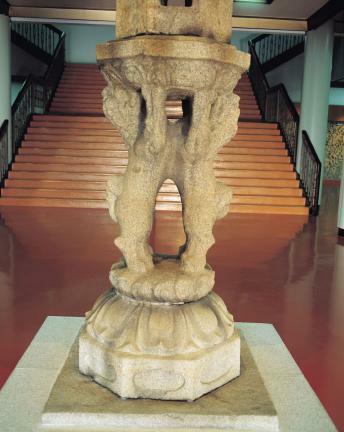 This particular stone is characterized by the use of a unique pedestal featuring elaborately rendered twin lions standing between the lower and upper lotus pedestals. The lions stand upright on their hind legs, chest to chest, supporting the upper pedestal with their raised front legs. The light chamber stone placed on the upper pedestal has an octagonal shape and four light windows. The roofstone is also octagonal with eight corners nicely turned up, with a finial shaped like a lotus bud. 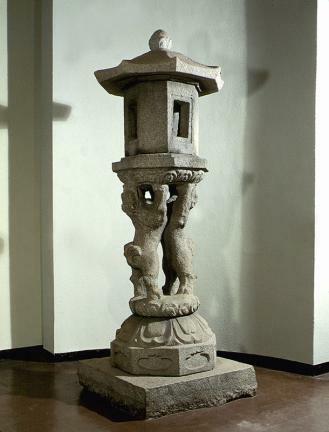 The stone lantern of the Unified Silla period (676-935) is generally regarded as a masterpiece with its delightfully simple structure combined with elaborately carved animal sculptures. 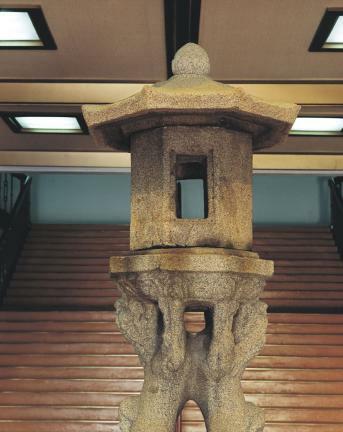 The lantern had originally been in Jungheungsanseong Fortress in Gwangyang, Jeollanam-do but was moved to Gyeongbokgung Palace in Seoul after a plan to smuggle it into Japan was uncovered during the Japanese Occupation (1910-1945). It is currently stored in the Gwangju National Museum.